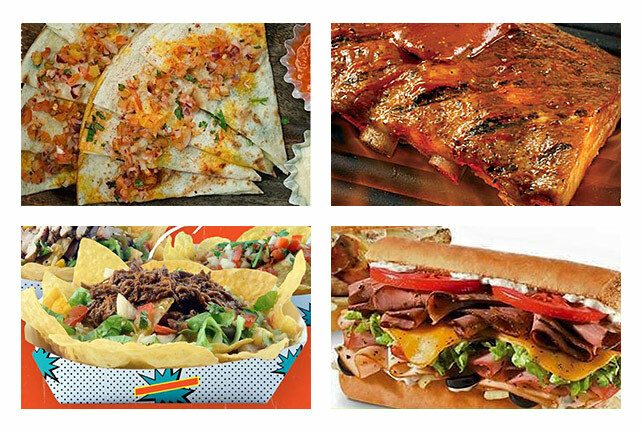 It's tough to pick through 75 mouthwatering concessionaires. 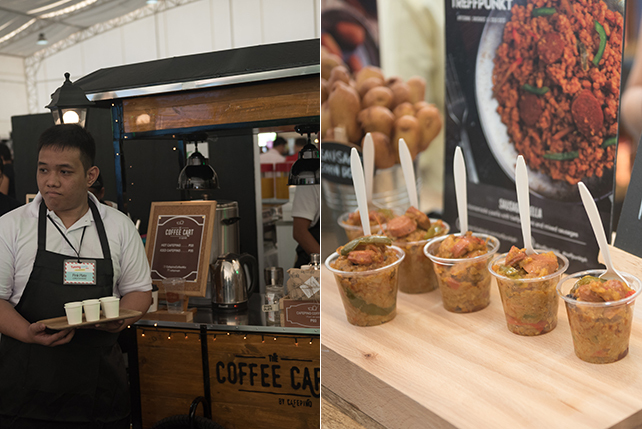 (SPOT.ph) Another year, another Yummy Eats, and this time we're happy that the concessionaires have been split evenly into sweet and savory. At the Metrowalk Tent (which was thankfully laid out to become less cramped), we saw the return of bazaar favorites like The Butchery, Casa San Luis Pastries, Chili Asylum, Manila Creamery, Merry Moo, and Theo and Philo, as well as novel enterprises like Nipa Brew and Bundtwagon. Was it just us or was everyone much more competitive this year? From serving n number of samples to bringing an actual Santa Claus, these are the 10 that stood out for us. This year's winners of the People's Chice Awards, Pufft's homemade marshmallows taste like sweet clouds in your mouth—sweet strawberry, salted caramel, and lemon souffle clouds. For P280/box of six, you can enjoy them any way you like, but we can imagine the Chocolate Cookies & Cream on extra chocolatey versions of s'mores. 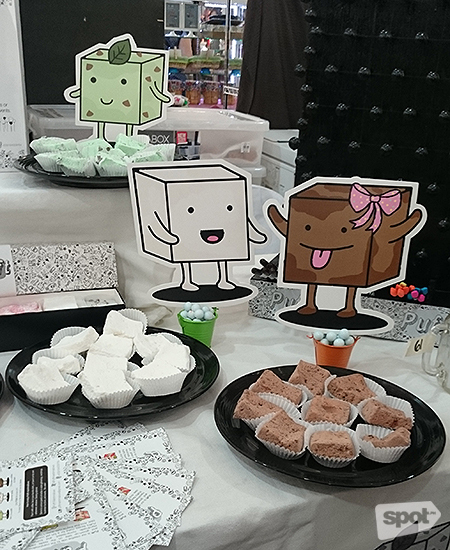 Find Pufft on Facebook or @Pufftmarshmallows (0916-400-9764; pufftmarshmallows@gmail.com). We're quite picky with our herb chicken, but Mommy Ann cooks to impress. It's rustic with a whole lot of rosemary, some good olive oil, and tasty potatoes. We love things that are simple but done right. 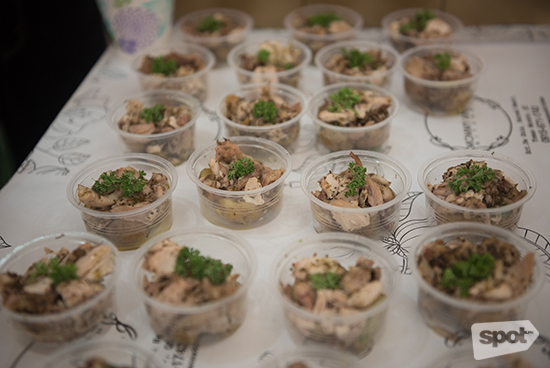 Find Mommy Ann's Herb Chicken on Facebook (0928-500-0091). We award Treffpunkt "Most Generous." This stall not only gave cups of paella, but also sausage rolls and corndogs. 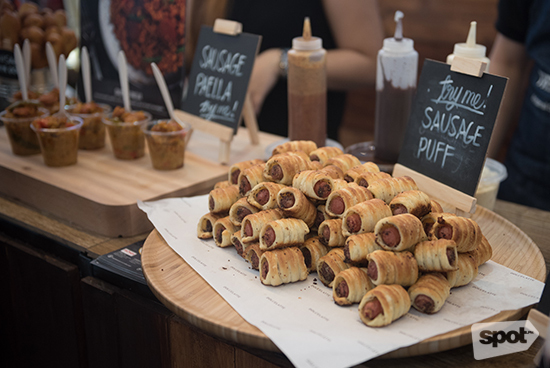 Treffpunkt is a German sausage shop in Cubao, and at their little kiosk, they were able to highlight their products in a way that made them stand out. Find Treffpunkt on Facebook. They will reopen a deli in the first quarter of 2016. This bakeshop/cafe is an oldie, but it's still very much a goodie. 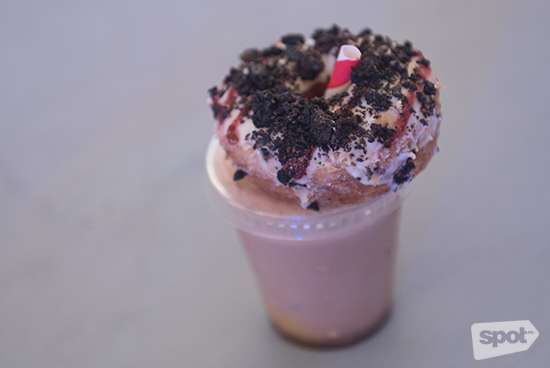 We were especially impressed by how they miniaturized their Croughnut Milkshake into sample sizes. That definitely stole the show. 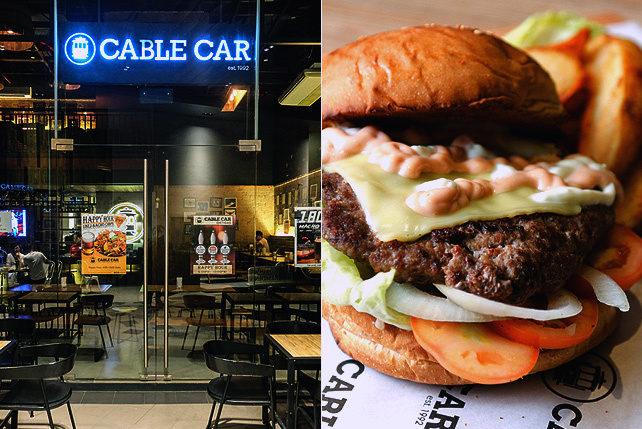 Dolcelatte has branches at Quezon Avenue, Quezon City; and SM Mega Fashion Hall, Mandaluyong City. Read mroe about Dolcelatte. 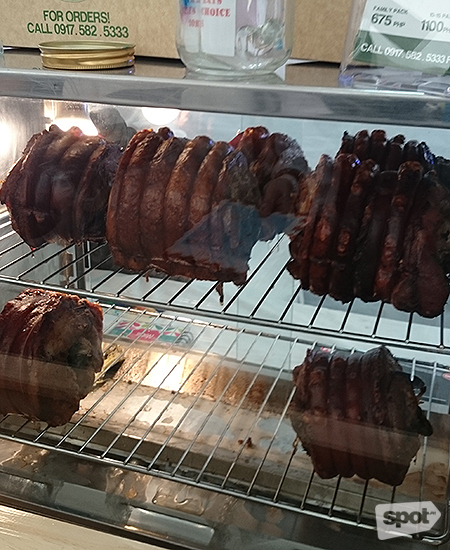 Bai's is more porchetta than the lechon we all know and love, but the exuberant owner tells us that he's Cebuano, hence the spices and flavors turn out the same. "God's butter," he tells us about the fat, picking extra succulent pieces for us. 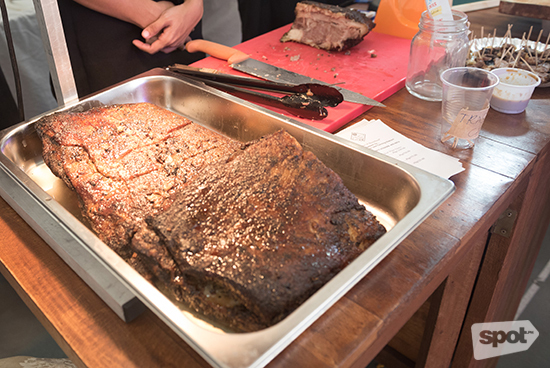 The skin is luxurious and dark brown, crispy just the way we like it. Price starts at P675 for around five people. Find Bai's Boneless Lechon Cebu on Facebook (0917-582-5333). Sevilla & Sons Sausage Co. This stall was one of several that sold sausages, but their chunky links and intense seasoning won us over. We can't even decide on a favorite. Sometimes, it's the Garlic Parmesan, other times it's the Jalapeño Chili. Maybe it's the Louisiana Hot Beef? Sevilla & Sons also gives instructions on how best to enjoy their sausages should you want to buy a pack for home. Find Sevilla & Sons Sausage Co. on Facebook. 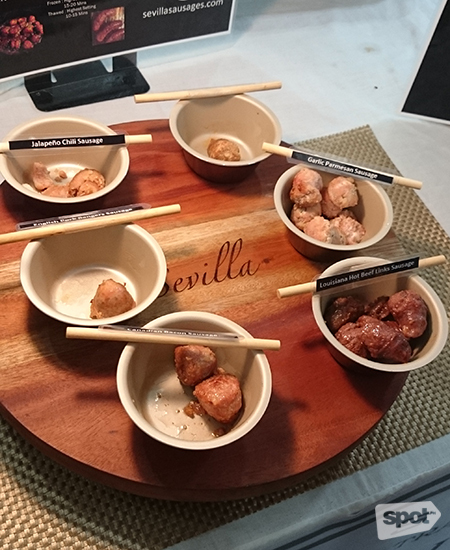 Read more about Sevilla & Sons Sausage Co.
Had Yummy Eats chosen to air a movie (like Burnt or Chef) instead of hiring a DJ, we would've stayed around THC's booth the entire time. Their chips have that thick-but-crunchy, kettle-cooked quality about it—but without the grease. 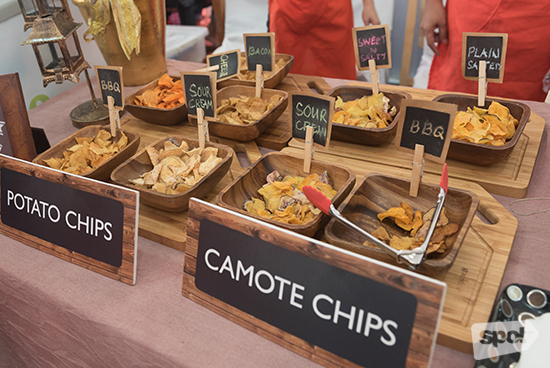 Both potato and kamote come in flavors like Sour Cream, BBQ, Plain Salted, Sweet 'n' Salty, Bacon, and Cheese. Find THC Truly Home Chips on Facebook (0917-843-1624). It's really hard to miss this sweet display. They came in with their very own live Santa Claus! Perfect for photo-ops! Christa Manila is famous for their chocolate cakes, but we were pleasantly surprised to discover their star-shaped Scandinavian cookies. They're light, airy, and crispy, quite unlike any other cookie we've met. We could actually qualify them as chips (they're fried!) 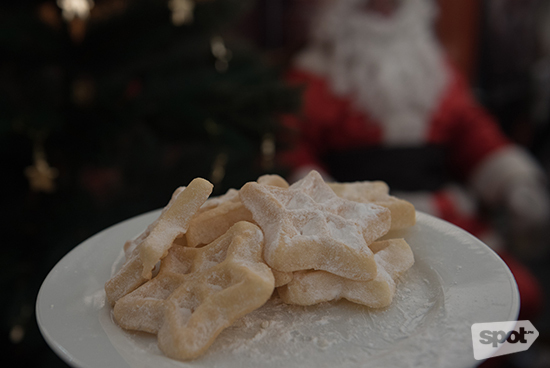 sprinkled with powdered sugar. Find Christa Manila on Facebook (0917-890-5747). The gloves are off when you put bagnet in the picture. 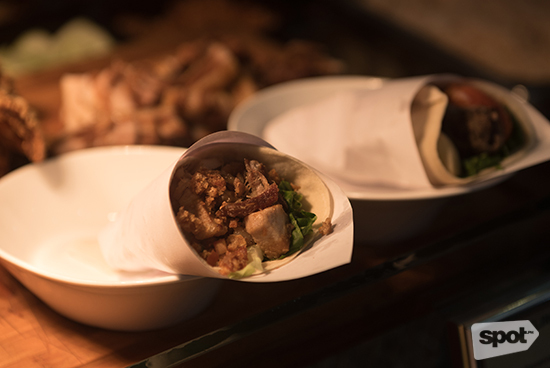 Gourmet Garage sure knows how to lift the heavy flavors of their skin-ful Bagnet Wraps—with just the right amount of tomato salsa, cucumber, and soy! Find Gourmet Garage on Facebook (0915-456-4808, 0918-495-2999). Roast beef is the kind of dish you have to eat hot to really enjoy, but Olympia's still manages to convey good flavors even when it was a little cold. The salty-savory notes are so potent, we forgot to dip it in gravy! It comes with your choice of rice, ciabatta, mashed potato, or pasta (P180 to P200). Find Olympia's Gourmet Roast Beef on Facebook (0916-414-0826).